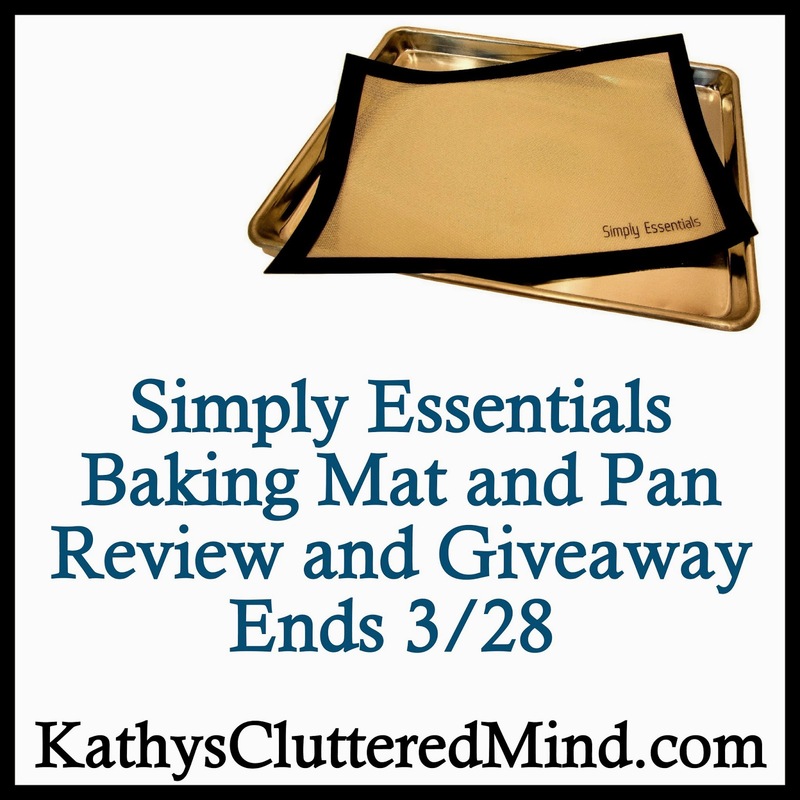 Kathys Cluttered Mind: Simply Essentials - Silicone Baking Mat and Commercial Baking Sheet Pan Review + Giveaway. 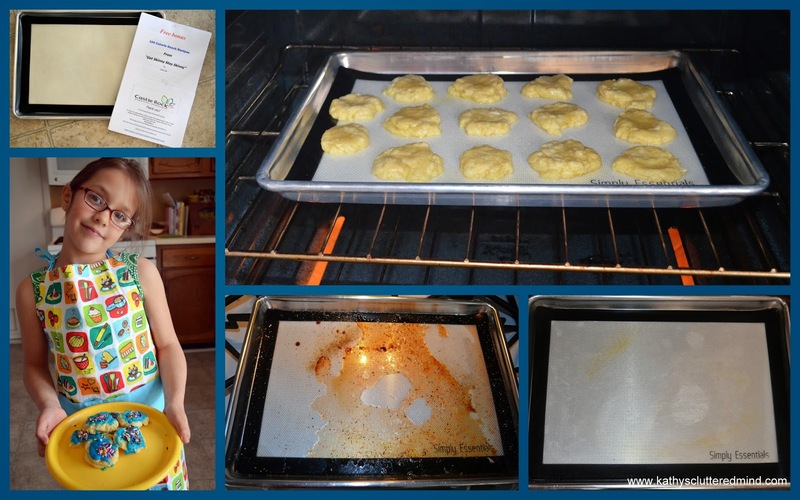 Simply Essentials - Silicone Baking Mat and Commercial Baking Sheet Pan Review + Giveaway. I received a 16 5/8 x 11 3/4 silicon mat and commercial baking pan from Castle Rock Essential Products, Inc to review. I must admit my kitchen pots, pans and appliances are pitiful. My pans are rusty, warped and permanently stained. And I'm ashamed to say that the majority of them were purchased at the dollar store. Since we started eating healthier I have been cooking and baking a lot more than I used to and am finding out that I NEED quality cookware and bakeware. I am also looking for products that can save this busy stay-at-home mom time!!! Good quality kitchen tools make all the difference!!! I was way too excited when our pan arrived and couldn't wait to use it. It is very rare that I get something to review for myself, most of the time it's stuff for the kids. The first thing I baked on it was a 5 lb ham. Now if you have cooked ham before you know that the mess on the pan afterwards can be quite a pain to clean....but not with this silicone mat and baking pan combo. Next we baked a batch of cookies. Guess what you don't even need a spatula to get them off, you can literally pick them right up after they have cooled. This is a revolutionary baking and cooking product. It is commercial grade, durable and easy to clean! The mat is BPA free and made of glass weave and food grade silicone. It fits perfectly inside the pan and may work with other pans in your kitchen as well. It will not only protect the baking pan and make cleaning up easier, but it will also help your food taste better and keep you healthier. Baked goods will brown more evenly. And there is no need for butter, cooking spray, oil or parchment paper anymore. The mat and pan can be used in all types of ovens and it provides even heat distribution. I used it with a gas oven and as you may know gas ovens can sometimes be temperamental with pans. You can freeze, refrigerate, bake, cook and roast on the mat! You can even roll out dough onto it. Talk about versatility! The mat can be reused over 1,000 times so you will get plenty of use out of it! The pan is a little larger than your average sized pan. It too is very durable and easy to clean (thanks to its mat friend). The sides of the pan are nice and deep so when cooking something like a ham you won't have to worry about the juices running over. The pan is very light too! Clean up is a breeze which saves me tons of time in the kitchen. Just use hot water and soap to wipe clean! It's so easy even the kids can do it! This combo also comes with a lifetime guarantee!!!! This baking pan and silicone mat combo are the perfect gift for every baker and cook! You can purchase the silicon mat and commercial baking pan on Amazon for $17.99! Mats are available in different colors! Simply Essentials has graciously offered to giveaway a baking mat and pan combo. All entries are optional, each entry option gives you more chances to win. This giveaway is not affiliated with Facebook in any way. The winner will be posted on the blog and will be emailed. Winner must reply within 48 hrs with their contact information or another winner will be chosen. Prize will be mailed to the winner by Simply Essentials.